There are scores of video formats, say, MP4, AVI, MKV, WMV, MOV, MTS, AVCHD, FLV, among which MP4 is the most universal format. An MP4 encoder is needed now and then to encode other digital video formats like MKV FLV MTS AVCHD etc. to MP4 that is compatible with nearly every media player, computer, phones, tablets, game consoles and video sharing sites YouTube, FaceBook, Vimeo, Dailymotion etc. There are many MP4 video encoders out there but it's essential to avoid the MP4 video encoding process takes too much time and loses too much quality. Look at these top-ranked MP4 encoder programs below. Input: nearly any video formats, MKV, AVI, MOV, WMV, VOB, FLV, AVCHD, MTS, TS etc. Great things about MacX include its wide range of format support, blazing fast MP4 video encoding speed and excellent out quality. It can easily encode SD, HD, 1080P, 4K UHD, 8K videos of any formats to MP4 and at the same time downsize large videos without quality loss thanks to its built-in HQ engine. The support for QSV acceleration enables it to encode video to MP4 in at least 5X faster speed than Handbrake and many more applications. It's worth noting that the video converter for Mac/Windows combines MP4 encoding, decoding, converting, downloading, editing and compressing into one piece of software. Follow the user guide below to get started. Run the program if you've downloaded the MP4 files encoder for macOS (macOS Mojave also inc.) or for Windows (Win 10 also supported). Click "Add File" icon to import video of MKV or AVI or FLV etc. you want to encode to MP4. After the video is loaded, you're offered options to select output video format. Select MP4 (H.264) or MP4 (MPEG 4). Know more about H.264 vs MPEG 4. Then click "Browse" to change the default destination folder. Check the box "Intel" next to Hardware Encoder if you haven't. 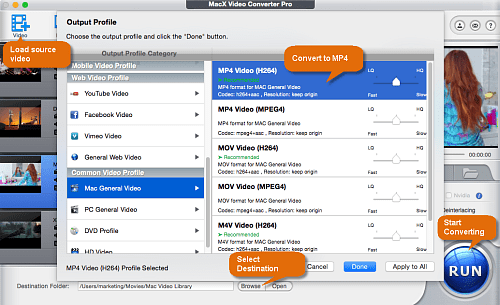 Click "RUN" to activate MP4 video encoding on Mac or Win without losing quality using the best video converter for Mac/Win. Based on our test results encoding speed, it only took a few seconds to encode a 490MB 4K MKV video to HD MP4. The speed also depends on your computer specs. * You can just keep the best video converter & encoder default settings for best quality. All the video options, like FPS, bit rate, resolution, aspect ratio etc. on the video settings section will be set to keep original, and there's no quality loss during the video encoding process. If you want to compress MP4 video, you can lower video res, FPS, bit rate etc. High quality and high compression ratio can be gained at the same time with this program. * It works as an MP4 video editor, allowing users to add subtitles to MP4 video, trim/crop, add watermark etc. * Follow to download MP4 video movie music from YouTube, Vimeo, Facebook, Dailymotion 1000+ sites with the versatile MP4 encoder software. OS: Linux, macOS, and Windows. Handbrake, as a well-know open source video transcoder that using third-party libraries like x265, libav, gets a place on the list of MP4 encoder software. This free MP4 converter for Mac/Win enables users to encode MKV, AVI, TS, M2TS to MP4 and the latest version 1.0.0 expands its reach to VP9 encoding. 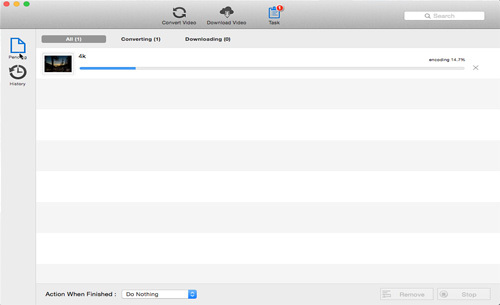 The Windows version of Handbrake gets support for QuickSync video, which partly speeds up MP4 video encoding process. The MP4 decoder & encoder offers some basic choices to enhance the MP4 quality, namely with parameter settings, output profile for devices like iPhone iPad, Android phones and tablets. * Encoding speed varies from setup to setup. And it takes a long time to encode 4K UHD MKV to MP4 - with 25 or lower FPS. * Handbrake stops encoding MP4 (encode failed error 3/4) and gives incomplete encoding for MP4 output with subtitles. * It tells that 20% of encodes have to be re-encoded but the it fails too, and it take 3 or more retrys to get the encoding finished. The MP4 encoder and free video converter for macOS/Win accepts common video formats input, like M2TS, MOV, 4K UHD MKV, VOB, M2TS, with preset profile for iPhone 6s/6/Plus/5s, iPad, Android mobile devices. Basic MP4 editing features are also offered by the MP4 transcoder, such as joining MP4 video files, extracting audio from MP4 video. Plus, with the MP4 video encoder, you can also download MP4 video from YouTube, Facebook and some other sites. However, Any Video Converter has some big problems. * Users have to pay attention to avoid installing plugins and malware during the program installation. * The MP4 encoder stutters/crashes at random and users have to restart again, especially when encoding 4K video to MP4. * The software takes quite a long time to encode video to MP4, according to users review from CNET. Free download the MP4 video encoder for Mac or for Windows to encode any video to MP4 format, such as 4K UHD MKV to MP4, AVI to MP4, FLV to MP4 etc, in blazing fast speed without losing quality. 100% clean and safe, no spyware, no adware, no plugin.